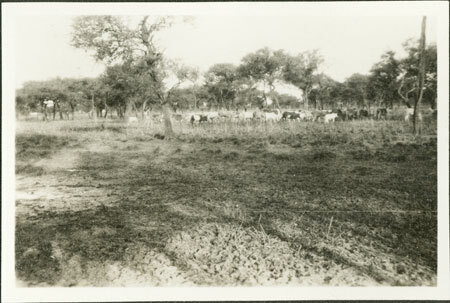 A number of cattle being herded by a man through a sparsely wooded area, possibly in the vicinity of the Bahr-el-Ghazal River. Motor vehicle tracks can just be made out in the mud in the foreground. Evans-Pritchard describes how he in 1930 he left Yoinyang area for Muot Dit by motor car with Nhial and two Zande servants. Note on print reverse ms pencil - "32/1 84 85 "
Morton, Chris. "Nuer cattle" Southern Sudan Project (in development). 03 Jan. 2006. Pitt Rivers Museum. <http://southernsudan.prm.ox.ac.uk/details/1998.346.85.2/>.